Chlorogenic acid is found in coffee mostly and a lot of plant compounds; it holds promise in many aspects of health and cognition similar to bioflavonoids and shares some effects similar to caffeine but less potent. May decrease the absorption of dietary carbohydrate. Our evidence-based analysis on chlorogenic acid features 66 unique references to scientific papers. Chlorogenic acid is a phytochemical found in coffee and coffee beans. It has been touted as being able to reduce blood sugar levels and potentially exert an anti-diabetic effect. It has also been implicated in weight loss and exerting an anti-obesity effect, but that is insofar correlation and not necessarily due to chlorogenic acid. It can be beneficial to supplement, although doses found in food sources are enough for a long-term preventative (anti-diabetic) measure. You are now following Chlorogenic Acid. You will be notified when any significant update is made. Chlorogenic acid and Caffeic acid were once thought to be anti-thaminases (compounds that can induce a thiamin (Vitamin B1) deficiency), however, this has since been shown to be false. Supplemental chlorogenic acid appears to have benefit in the range of 120-300mg oral intake, with higher doses still possibly beneficial (not really tested sufficiently). These doses appear to benefit blood pressure and circulation mostly. This dose seems to be low enough that moderate to high doses of plants with a rich chlorogenic acid content may confer the benefits listed on this page, this most notably includes green coffee extract. The Human Effect Matrix looks at human studies (it excludes animal and in vitro studies) to tell you what effects chlorogenic acid has on your body, and how strong these effects are. The decrease in systolic blood pressure with chlorogenic acid has reached 15 points systolic in hypertensives (150mmHg systolic initially) and appears to maintain at that level until supplement cessation. Coffee and Green Coffee; in which 1L of coffee contributes 500-800mg Chlorogenic acid (250-400mg caffeic acid) An average coffee drinker tends to consume 0.5-1g of chlorogenic acids daily. Fruits such as apples, pears, eggplant, tomatoes, and blueberries. Strawberries as well. Green Coffee water-soluble extract has been used multiple times in hypertensive persons to reduce blood pressure in dosages below 200mg. This is contributed to chlorogenic acid, and specifically its metabolite called ferulic acid, decreasing blood pressure and improving vasoreactivity. Although benefit can be seen with Chlorogenic acid from coffee, supplementation may be a better option. A compound produced during roasting of coffee beans called HHQ can inhibit the actions of Chlorogenic Acid in vivo; coffee without HHQ shows dose-dependent decreases in blood pressure as a result of Chlorogenic acid, which does not occur with HHQ-containing coffee. Structurally, Chlorogenic Acid is a combination of two molecules. It is a caffeic acid molecule bound to a Quinic Acid moiety; the combination is referred to as Chlorogenic Acid, and all three molecules can be bioactive after chlorogenic acid ingestion. Chlorogenic acid can bind to Bovine Serum Albumin in in vitro assays. During cooking, chlorogenic acid (via its metabolite caffeic acid) can bind to amino acids to form pigmentation under basic conditions. 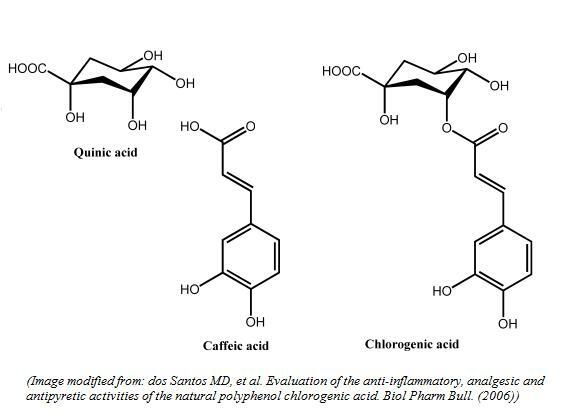 Chlorogenic acid itself does not appear to be taken up in the small intestine, and only up to 8% of it by weight is hydrolyzed into caffeic acid and subsequently absorbed (in rats). Chlorogenic acid is highly not actually detected in plasma after ingestion, only its metabolites, although some human studies do note small percentages of ingested chlorogenic acid in the urine after 2g of consumption (1.7%). However, if chlorogenic acid reaches the colon there is a chance that the gut microflora can break the quinic bond and release caffeic acid. Chlorogenic acid can also be absorbed at a low amount in the colon, Colonic metabolism and absorption of chlorogenic acid seems to be where most bioactivity occurs. While in the intestines, chlorogenic acid can bind to and hinder the uptake of dietary zinc as well as non-heme Iron. When chlorogenic acid is digested, it undergoes metabolism into various bioactive metabolites. One study noted 12 urinary metabolites totaling 55.8% of the oral dose. As mentioned previously, about 1.7% of the ingested chlorogenic acid can leave the urine unchanged, and thus the metabolites are most likely the cause for bioactivity in the body. Ferulic acid can be produced from chlorogenic acid, and one study noted about 0.8% of a 2g oral dose was detected in the urine as ferulic acid. Caffeic acid was noted as a urinary metabolite at 1% of the oral dose. Dihydrocaffeic acid appears to be in similar amounts. About half (49.5%) of ingested chlorogenic acid is metabolised into hippuric acid, and one molecule of chlorogenic acid might be able to produce two molecules of hippuric acid, via metabolism of both the caffeic acid and quinic acid moieties. This appears to be a colonic metabolite, as persons without a colon did not have this molecule in their urine. Other possible metabolites that have been noted are vanillic acid, benzoic acid, and 3-hydroxyphenylpropinoic acid. As assessed by Oxygen Radical Absorbance Capacity (ORAC), caffeic acid appears to have similar anti-oxidant potential as chlorogenic acid, and dihydrocaffeic acid has a significantly greater capacity. Coffee consumption per se is associated with higher Homocysteine levels in even healthy persons, and it seems both caffeine and chlorogenic acid are partly to blame. Homocysteine is seen as a biomarker of cardiovascular disease, and when it increases whatever causes heart diseases tend to also increase. It is currently not known whether coffee ingestion merely increases the biomarker for cardiovascular disease, or whether it can increase risk. In regards to coffee and blood pressure, it is well established that caffeine can cause transient (lesser than 3 hour) blood pressure spikes in the hypertensive; however, long-term associations with coffee and blood pressure are unclear according to a recent meta-analysis. It seems that caffeine is slightly pro-hypertensive compound whereas chlorogenic acid and its metabolites exert a potent anti-hypertensive effect. Green coffee extract (with a high chlorogenic acid content) has been shown to reduce blood pressure in humans and this effect is contributed to the metabolite ferulic acid, which increases vasoreactivity and general blood pressure lowering ability. Chlorogenic acid may be able to induce body fat loss via acting as a PPARa agonist, and increasing body heat produced. It may also reduce proliferation of new fat cells through its anti-oxidant effects. Chlorogenic acid appears to have a weak psychostimulatory effect in rats, vicariously though caffeic acid and m-coumaric acid. Ferulic acid and 3-hydroxyphenylpropinoic acid had no effects. The degree of increased ambulatory activity was approximately one third that of caffeine at physiologically relevant dosages. Chlorogenic acid, as well as coffee (both caffeinated and decaf) is able to act as an anti-oxidant in neurons against Hydrogen Peroxide induced stress. The effect appears to be mediated through upregulating the anti-oxidant enzyme known as NQO1. Coffee is known to be associated with protection against Parkinson's Disease over a long period of time as evidence by epidemiology, and this historically has been thought to be due to the caffeine content. Chlorogenic acid may also preserve dopaminergic neurons by suppressing neuroinflammation. There has been a noted correlation between coffee ingestion and less fat mass in both rodents and humans, results which are confounded with the inclusion of caffeine which may suppress fat gain over time. Additionally, there may be social differences between coffee drinkers and non-coffee drinkers leading to weight discrepancies. There is some evidence, however, that this association between coffee and weight (inverse relation, more coffee being linked to less fat mass) extends to decaffeinated coffee; excluding caffeine as a variable. Laboratory results, however, suggest that most of the weight loss effects of coffee are done via caffeine (as coffee compared to decaffeinated coffee exerts significant differences in fat mass reduction). There appear to be no differences in lipid metabolism, lipolysis, or direct anti-obesity mechanisms which can be contributed to chlorogenic acid rather than coingestion of caffeine which lays suspicion that the correlation between decaffeinated coffee and weight loss lays not in human biochemistry, but mere caloric displacement (drink calorie free coffee instead of having a treat) or perhaps vicariously through improved glucose tolerance. Either that, or doses in coffee are too low to exert appreciable effects. Chlorogenic acid, at 1g intake, is able to reduce insulin and glucose spikes following a meal without affecting overall levels of insulin or glucose significantly. Longer term intake can reduce carbohydrate uptake, with the most promising result being 6.9% reduced glucose absorption in the intestines. Many in vivo studies note that coffee reduces the risk of diabetes and improves glucose tolerance, which is at odds with studies that suggest caffeine impairs glucose tolerance in healthy individuals. The causation for this difference lies in chlorogenic acid, which appears to exert more of an anti-diabetic effect than caffeine exerts a pro-diabetic effect when dosed in accordance with a cup of coffee. Although there is some work that suggests no relationship between coffee ingestion and improved glucose tolerance, the majority of evidence seems to lean towards the 'anti-diabetic' conclusion regardless of caffeinated or decaffeinated. The anti-diabetic effects seem to be greatest in the elderly and those who combine caffeine ingestion with weight loss. One of the mechanisms of chlorogenic acid and diabetes prevention could lay in its actions as an alpha-glucosidase inhibitor which reduces the rate or amount of carbohydrate uptake. Additionally, chlorogenic acid can increase muscular glucose uptake by two means. It can directy stimulate AMPK (non-insulin dependent) as well as phosphorylate Akt (stimulate GLUT4). Direct causation of this may lie with the metabolite of chlorogenic acid, caffeic acid, as chlorogenic acid per se does not increase AMPK phosphorylation in vitro. The specific isoform being activated is AMPKa2. Chlorogenic acid and related caffeic structures can inhibit the enzyme glucose-6-phosphatase (G6P) in vitro and potentially reduce the amount of glucose produced by the body, which can be seen as therapeutic for glucose control in diabetics. 0.5-1mM of chlorogenic acid, in vitro, has been shown to reduce 40% of active G6P in liver cells and oral administration of 3.5mg/kg bodyweight in rats did not change when the peak of blood sugar after feeding occurred (Tmax), but lowered the severity of the peak (Cmax) and overall exposure to glucose (AUC). Seems to be a pretty effective carb-blocker; and one that is not well-absorbed where it blocks carbs in the small intestines. Which is good, you don't want to absorb something that should stay in the intestines to do its job. The metabolites of chlorogenic acid, ferulic acid and p-coumaric acid, can potentiate the effects of thiazolidinediones and metformin on increasing glucose uptake into cells. Additionally, the suppression of PPARy by chlorogenic acid and metabolites may be useful in alleviating the known side effects of these medications on fat metabolism and serve as adjunct treatments. These synergisms with ferulic acid extend to muscle cells as well as fat cells. Vanillic acid, a minor constituent of the metabolites, seems to be able to work against metformin; this is unlikely to occur in vivo from chlorogenic acid supplements due to the high concentration needed. There have been reports of allergies to Green Coffee Beans and thus the extract, although this does not seem to be due to chlorogenic acid. It has been investigated as to whether it is the causative agent in numerous herb-related instances of harm (due to it being in many plants) but does not appear to be causative of harm in and of itself. Doesn't appear to be harmful at all, and a lack of case studies despite chlorogenic acid being very prominent in food sources. That being said, a lack of evidence precedes any conclusions. ^ Microbial metabolism of caffeic acid and its esters chlorogenic and caftaric acids by human faecal microbiota in vitro. ^ Chlorogenic acids and other cinnamates – nature, occurrence and dietary burden. ^ a b Chlorogenic Acid and Caffeic Acid Are Absorbed in Humans. ^ Identification and Antioxidant Activity of Novel Chlorogenic Acid Derivatives from Bamboo (Phyllostachys edulis). ^ Caffeine and coffee: their influence on metabolic rate and substrate utilization in normal weight and obese individuals. ^ Coffee Consumption and Risk for Type 2 Diabetes Mellitus. ^ Coffee Consumption and the Incidence of Type 2 Diabetes.